In case of a cancellation within one week to arrival 1st night is payable to the hostel. In case of a no show whole remaining balance is payable to the hostel. 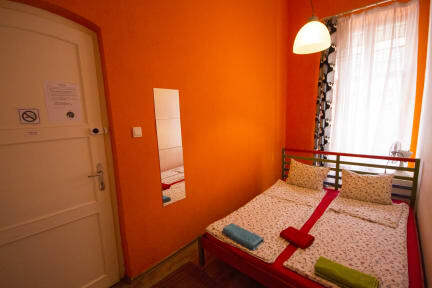 If you're looking for privacy during your stay in Budapest, Pal's Hostel is a great place to start from. This hostel offers comfortable private rooms and spacious apartments with beautiful views across the road to Szent Istvan's Basilica. It's located very near the Chain Bridge and the intersection of all three metro lines so it's easy to get anywhere in the city. Hostelworld guests have said 'it's like having a piece of your own home in another city' and they'd 'definitely recommend this hostel for those who want to spend their night in a quiet apartment and in a very central area'. We’re not your average hostel, indeed, but rather a chain of apartments and dorms located in the very centre of Budapest around St. Stephen's Basilica. If you fancy some privacy and want to stay in a place that feels just like home, come to Pal's Hostel and enjoy your very own apartment in Budapest! As well as private apartments, we also offer private rooms with shared bathrooms, and even shared dorms! Pal's Hostel is located in the very centre of downtown. From here you can easily get to most of the sights on foot, such as Saint Stephen's Basilica, The Chain Bridge, Parliament, Andrassy Avenue (part of the World Heritage), the Opera House, the Great Synagogue, the National Museum, Vaci Street, and Vorosmarty Square. The Danube bank is only a five minute walk away too! Nearby there are also many restaurants, cafes, pubs, clubs, and party places all within walking distance, like Akvarium Club, Anker Club, Castro Bistro, Szimpla Pub and Katapult. We are also located very close to Deak Ferenc Square, which is the main junction for all underground metro trains in Budapest. 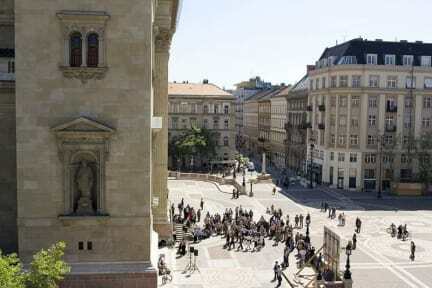 Other important sightseeing spots are near by too, such as Buda Castle (part of the World Heritage, along with the Fisherman's Bastion, Matthias Church and the National Gallery), as well as Heroes' Square, the City Park and the baths (Szechenyi, Gellert, Rudas). You can walk to these places from our hostel in 20-30 minutes. Here at Pal's we are happy to be at your assistance; you can print your e-ticket, buy tickets for the Szechenyi baths, Gellert baths or even the caving tour. We also sell the Budapest Card. We have great local knowledge and advice on the best spots in town to share with you! We can also help you get to Ozora Festival, Sziget Festival or Balaton Sound! We can even pick you up at the airport for €24 for 1-4 people; this means if there’s four of you it’s only €6 per person. Public transport is about €2.50 per person. Our contact information will be in your booking confirmation email. Please note that our rooms called 'Basic Double Bed Private (Shared Bathroom)' are literally with double beds, not two single beds. Please also note that we have no elevator for the rooms with shared bathrooms (but they’re only on the 1st and 2nd floors:)). Wat een top hostel! Aardig personeel en vooral heel erg behulpzaam (er ging iets mis met de betaling). Ze deden er alles aan om me te helpen en om het te fixen. Beautiful rooms and great service! Een van de beter hostels waar ik al ben geweest. Super grote kamer met eigen badkamer , keuken en living voor maar 40 euro per nacht. De locatie was ook pal in het centrum !! Het persoon was super vriendelijk. Dit hostel is echt perfect, niets op aan te merken ! Het hostel ligt in het hartje van het centrum van Boedapest. Zo alles is dichtbij en niet al te ver lopen. Het is schoon hostel. Heg enige minpunt vond ik de bedden. Die kraakte heel erg. Dus als iemand zich omdraait was meteen iedereen op de kamer wakker. Alleen al voor de locatie van hey hostel zou ik terug gaan. Een aanrader! De hoofdaccommodatie van Pal's Hostel ligt op (net naast) het plein bij de Sint Stefanus Basiliek, maar daaromheen hebben ze verschillende locaties met appartementen. We dachten niet gunstiger te kunnen zitten dan de hoofdaccomodatie, maar niets bleek minder waar. We zaten in een heerlijk, schoon, goed onderhouden appartement met uitzicht op de basiliek, de prachtige oude gebouwen en het bruisende plein. Perfecte locatie, met alles op loopafstand. The stay was good! However, the location we stayed at, didn't really feel as a hostel. It felt more like a students house with a couple of rooms. The room and all shared spaces were clean and having made up beds and towels is really nice. The only thing missing at our location was the typical hostel atmosphere. Appartementen verspreid over gebouwen rond plein en in zijstraten van plein. Gemeenschappelijke ruimte in hoofdgebouw. Toegangsdeuren complex dag en nacht open wat het uitnodigend maakt voor nachtelijke praktijken in de trappenhuizen en gangen. Appartement schoon. Wij hadden een appartement waar met drie kamers de badkamer en keuken gedeeld werden. Prima locatie.